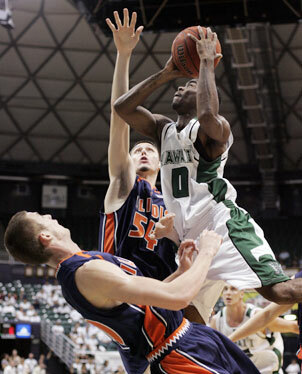 Hawaii wing Jared Dillinger went up for a shot in last night's 79-77 loss to Illinois. For the second time this season, the Hawaii basketball team saw a game come down to the final seconds. And for the second consecutive time, the Rainbow Warriors trudged off the court stunned by a heart-breaking loss. Calvin Brock's layup with 5 seconds left lifted Illinois to a 79-77 over the Rainbows last night at the Stan Sheriff Center. A week after suffering a 73-72 loss to San Diego, the Rainbows led by as many as 13 points in the second half only to see the Illini fight back with a 25-5 run to take the lead. After UH responded behind the play of senior Bobby Nash, who finished with a career-high 30 points, Brock's layup was the difference as UH fell to 0-2. The Rainbows have a quick turnaround for tomorrow's game against Alcorn State at the Sheriff Center. Tip-off is again set for 8:05 p.m.
Two games. Two doses of heartbreak. For the second straight game, a score in the final seconds sent the Hawaii basketball team to a wrenching home loss as Illinois pulled out a 79-77 win last night at the Stan Sheriff Center. Hawaii led for the first 33 minutes against the Big Ten power, only to see the Illini battle back and take the lead for good when Calvin Brock drove along the baseline for a layup with 5 seconds left, sending UH to its first 0-2 start since 1993. "We had them several times; we had so many chances it hurts even more knowing the caliber of Illinois," UH senior Riley Luettgerodt said. "We're going to watch them in the NCAA Tournament probably. That would have been a big win for us." The Rainbows have a quick turnaround for tomorrow's game against Alcorn State at the Sheriff Center. Tip-off is again set for 8:05 p.m. Illinois opens its three-day run at the EA Sports Maui Invitational on Monday against Arizona State. The 3,183 fans, distracted during timeouts by the UH-Nevada football game shown on the arena's video screens, saw Illinois rally from a 13-point second-half deficit to sidestep UH's upset bid. The UH loss came a week after San Diego celebrated a 73-72 win on the Sheriff Center floor. "The little things keep beating us," UH coach Bob Nash said. "But I'm proud of my team, but it's the same old story, just one or two plays at the end of the game are costing us. "It's a very disappointing loss, because I thought we played well enough to win." UH was led by Bobby Nash's career-high 30 points on 10-for-20 shooting from the field. Luettgerodt finished with 16 points and Jared Dillinger contributed 12. "I just tried to be the catalyst to help us get back in the game," Nash said. "The main thing is we came up short. It's not about me. It's not about any one person. It's about the whole team. We came up short, but we can get better from this. They're a good team, kudos to them, but we should have come out with the W today." 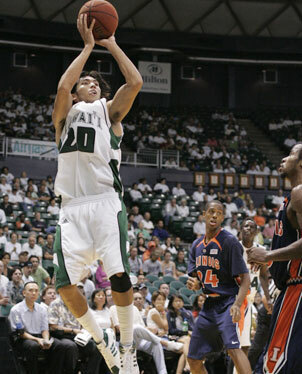 UH's Kareem Nitoto went to the basket in front of Mike Tisdale and over Bill Cole last night. Illinois guard Chester Frazier led the Illini with 19 points and center Shaun Pruitt finished with 15 points and grabbed seven rebounds as Illinois outrebounded the Rainbows 42-28, 16 coming off the offensive glass. "We knew (the Rainbows) would play at a higher level and they did," Illinois coach Bruce Weber said. "They came out right off the bat and made some unbelievable shots. You have to give them credit. We were fortunate to win. ... (Bobby) Nash just took it on his shoulders." Hawaii led throughout the first half, going up by as many as 10, and took a 42-36 lead into halftime. Dillinger had 11 points in the half, the last coming on a 3-pointer from the corner with 4 seconds left after Illinois had closed to within three at 39-36. Bobby Nash also had 11 points before the break, as all 10 Rainbows who suited up saw playing time. The lead swelled to 13 with 12:50 left, with Luettgerodt's fast-break layup giving UH a 62-49 lead. The Rainbows would go more than 8 minutes without another field goal. As the crowd celebrated UH's football victory, drawing one of the loudest roars of the night, Illinois embarked on a 25-5 run and took its first lead at 65-64 on a 3-pointer by Frazier with 6:47 left. The Illini lead grew to 74-67 with 4:21 left. "They kept chipping away -- a couple bad shots here and there and we couldn't pull it out," Bob Nash said. Nash then led the Rainbows back, scoring on a short jumper and drilling back-to-back 3-pointers from the top of the key to give UH a 75-74 lead at the 2:56 mark. The score was tied again at 77 when Pruitt missed a hook and Brock pulled down the offensive rebound and the Illini called timeout with 31 seconds left. With the shot clock off, Illinois ran the clock down and Frazier found Brock, who drove along the baseline for the game-winning layup with 5 seconds left. UH inbounded the ball and couldn't get a timeout called before the buzzer went off. "I was trying to get a time out to get something set up where we get a look at the basket, but he didn't recognize it," Bob Nash said. "We inbounded the ball and the clock started and that was the end of it. "(The official) said he never saw me call me the timeout, I'm not putting it on them. I thought I called it and they didn't recognize it. Maybe I have to be more demonstrative in my efforts to get the time out, but that didn't happen." When the Illinois basketball players rushed off the court without shaking hands moments after their 79-77 comeback win over Hawaii, coach Bruce Weber wasn't trying to slight the Rainbow Warriors or their fans. In fact, he was happy for Hawaii's fans and football team -- whose thrilling victory at Nevada via a Dan Kelly field goal was displayed live in full glory in the Stan Sheriff Center's large flat screens -- but the coach didn't want referees to have a chance to order a replay of the final 5 seconds of the game, when the clock didn't start immediately on Hawaii's final inbounds play. By the time the Fighting Illini belatedly returned to the court for a half-hearted shake, Hawaii was already headed to the locker rooms. "l'm happy for Hawaii -- the football team won, that was great," Weber said. "It wasn't anything to do with bad sportsmanship." The Fighting Illini took full advantage of distracted Warriors fans watching the big screens, as Illinois staged a 25-5 run over the heart of the second half to go up 74-67. "The crowd goes nuts, we go on the run then," said Weber, who has compiled a 114-28 record at Illinois. "I think their kids tired; they played at such a high level." When Kelly's kick rang true, it got the loudest cheers of the night. But steadily the 3,183 fans had less and less to cheer about as point guard Chester Frazier hit big shots and Calvin Brock came off the bench for the game-winning layin with 5 seconds left. "Last year, we couldn't finish games," said Brock, a junior. "Coach was just telling us we're in it, keep fighting, keep fighting." But Brock didn't think the peripheral activity distracted the Rainbow Warriors -- even when the crowd cheered loudly on a big football play, and Frazier just happened to nail a big 3-pointer simultaneously. "The crowd's attention was elsewhere, but the basketball team, they were on the court. They played real well tonight, at a high level. Having (Bobby) Nash (30 points) on their team, they were at a high level." Illinois avoided the same fate as fellow Big Ten team Michigan State in 2005, when the No. 4-ranked Spartans swung by the Stan Sheriff Center on their way to the Maui Invitational Tournament, but were blown out by the Rainbow Warriors first. Weber said he and his team talked about it before the game. Frazier responded with 19 points, Shaun Pruitt added 15, Brian Randle 12 and Brock 11. 3-point goals -- Illinois 5-17 (Frazier 3-6, Randle 1-2, Meachen 1-4, Alexander 0-1, Holdren 0-2, Cole 0-1, McCamey 0-1), Hawaii 6-13 (Nash 3-5, Dillinger 3-6, Nitoto 0-1, Mayen 0-1). Personal fouls -- Illinois 21, Hawaii 25. Fouled out -- Amis. Steals -- Illinois 4 (Frazier, Randle, Holdren, Brock), Hawaii 3 (Dillinger 2, Luettgerodt). Blocked shots -- Illinois 3 (Pruitt, Cole, Tisdale), Hawaii 2 (Amis 2). Turnovers -- Illinois 15 (Frazier 4, McCamey 3, Alexander 2, Brock, Meachen, Pruitt, Cole, Tisdale), Hawaii 11(Dillinger 4, Luettgerodt 3, Nitoto 3, Verwers). Officials -- Dan Chrisman, Mark Whitehead, Winston Stith. A-- 6,308.